There is finally closure for the 39 distraught families in the northern Indian state of Punjab. Union Minister General VK Singh brought back the mortal remains of Indians killed on a special plane from Iraq. All of the individuals were kidnapped and killed by the terror outfit ISIS. They were not insured and remained out of government sight while they were working in the war-torn city of Mosul after traveling from India through unauthorized travel agents. Twenty-seven of the 39 people killed are from Punjab. Twenty-five-year-old, Manjinder Singh, was one of the ones killed. His family in the Bhoewal village of Amritsar has been mourning ever since India's external affairs minister, Sushma Swaraj, made the announcement about the death of the Indians in the parliament. The 25-year-old had agreed to go to Iraq to work as a labor worker in 2013 through an unauthorized travel agent in Punjab after paying two lakh Indian rupees (380 US dollars). The travel agent had promised to take him to the relatively safe Erbil province in Iraq but sent him to Baghdad where from he was eventually moved to Mosul. Gurpinder Kaur, sister of 25-year-old victim Manjinder Singh, in Delhi with a delegation of victims' families. His sister, Gurpinder Kaur, led families of the victims to Delhi to meet with top central minsiters. She says a travel agent duped her brother and extreme poverty that forced him to move to Iraq. "Most people are not educated and get easily cheated by the travel agents who promise to give them hundreds of dollars in salary" said Kaur. Seven kilometers away at Babowal village in Amritsar, another family is in grief. Twenty-three-year-old Harsimranjeet Singh was promised a job by a travel agent against three lakh rupees (4600 US Dollars) in Afghanistan by but was taken to Iraq instead. "The travel agent cheated my brother after winning his confidence", said Sukhdeep Kaur, sister of Harsimranjeet Singh. Manjinder and Harsimranjeet were duped by a common travel agent who remains untraceable after sending them to Iraq. The government initially said there is no confirmation about their death but the only man who survived the massacre in Mosul, Harjit Masih, stood by his story that the 39 other Indians kidnapped with him in 2014 were shot dead while he escaped. His account was denied by the government. "I was given the greed of a job and told not to say that the Indians are dead", he said. 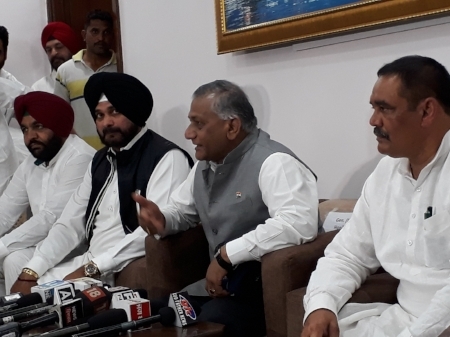 Union Minister General VK Singh, gives a press conference in Amritsar after the mortal remains were brought back to India. The Punjab state government has announced an ex gratia of five lakh rupees and a government job to one member of the families of those killed. "We will give ex gratia of five lakh rupees to each of the families and the CM has said on the floor of the house that their complete rehabilitation and job to each family," said Navjot Sidhu, a minister of the state of Punjab. Sending youth abroad for work is a lucrative business in Punjab. Local newspapers are full of advertisements promising opportunities for Punjabis. But the travel agencies deny all allegations. They say no one can be forced to go against his wish. "They go to war torn countries like Iraq just for earning more as they are paid very poorly in India, problems can happen anywhere and in any country, money is the driving force for the Punjabis going to countries like Iraq," said Joginder Singh, a Punjab-based Travel Agent. Last year alone, 222 cases were reportedly registered against travel agents in the four districts of Kapurthala, Hoshiyarpur, Jalandhar and Shaheed Bhagat Singh Nagar. In all, 366 people were booked and 92 arrested. "How can you make a person understand who has no food? Many go illegally and there are many agents in Punjab who send them there," said Manpreet Singh Badal, Finance Minister of Punjab. The center has put the onus on the state governments to check unauthorized travel agents that exploit people in the name of employment. "These 40 people had no record in any embassy, they had traveled through illegal agents. When that's the case, then half the time we don't know where they have gone. We have written to all the states requesting they please track down unauthorized travel agents and take action against them," said Gen VK Singh, Union MoS. The killing of Indians in Iraq by the ISIS should be enough to prevent people from falling in the trap of unauthorized travel agents who promise employment and a good life. It is certainly a wake up call for the government to crack a whip on the unauthorized travel agents duping people with false promises of employment abroad.